Caffeine- free, that’s right. For years, coffee coursed through my veins on the regular. At one point, I used to drink so many espressos that if you cut me, I might just bleed coffee. I was 100% under the impression that I needed coffee to function. Death before decaf and all that. I would laugh at my mum for ordering a decaf cappuccino - but now I know she had it right this whole time! 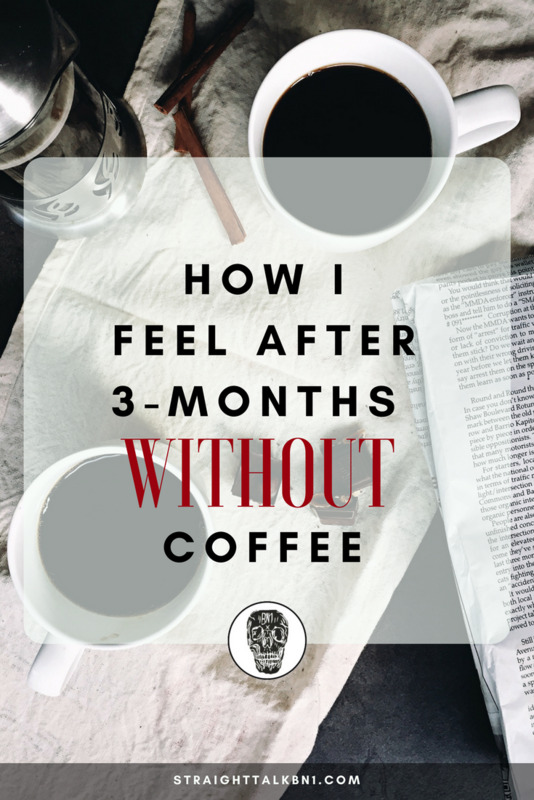 If you’re one of my regular readers, you might’ve previously read Why I Quit Coffee in the first place. I just wanted to check-in, and give you a little update one this small but awesome change that I made. I don’t mean to be cliche, but I feel like a totally different person. So, what’s different? First off, I’m sleeping much better. It’s easier to fall asleep, I don’t have constant thoughts racing through my head and I can make it through the whole night undisturbed. Another sweet perk and something I thought I would never say - I'm finding it easy to get up in the morning. I don’t need a cup of coffee to lure me out of bed. I can just get up - no problem. I used to live for a lay-in, and not be awake until I’d had my first cup, but now I’m full of energy and ready to embrace the day… Yep, I know that sounds so lame, but it’s actually really great. I decided to quit coffee initially because of the constant weird thoughts buzzing around in my brain. Coincidence or not, my anxiety has almost disappeared! I think the combination of deciding to take control of my mind, and quitting the mood-enhancing quality of coffee has worked together to make my brain much quieter and I’m so thankful for that! There's nothing quite like an orderly brain. I'm telling those voices of doubt in my head to do one. And it's goddamn working. It's best to cut down at first and then slowly phase it out. It's a good idea to replace it with something less caffeinated like black or green tea - that way you can still enjoy a hot drink and not feel lost with a mug in your hand. Would you ever quit coffee? Let me know in the comments!